That is exactly what you need to find out. Very often, it’s the things that you don’t know about that give you the most trouble – when you least expect it, and when you’re the least prepared. If all of the news from the trenches comes to you from your regional and district managers, and if they get all of their news from their store managers, it may appear that you have a very smoothly-function operation, all the way down the line – when in fact, there may be front-line problems which you just don’t see, and which could be seriously weakening your business. A professionally-conducted client satisfaction survey (such as those done by Compechek) may reveal, for example, that your business customers find your online ordering system difficult to use, or that they are faced with long waiting times when they need to place or track an order by telephone. Customer service satisfaction surveys may show a high rate of inaccurately or incompletely filled orders, with a long, frustrating process for resolving ordering problems – or worse yet, frequent problems with rude or unhelpful customer-service personnel. None of these things may be showing up in your managers’ reports – but all of them may show up in surveys for customer satisfaction. And your drivers may be on time when they make their deliveries to your customers’ facilities, but are they rude or friendly, cooperative or uncooperative? Do they check in with the person in charge of purchasing and deliver the order to the stockroom, or do they get the first person they see to sign for it, and dump it in the parking lot near the back door, then drive off? You might not know unless you ask your business customers. 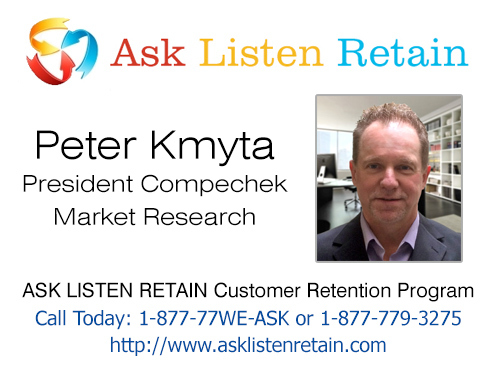 Compechek’s ASK-LISTEN-RETAIN system for survey analysis and response includes several built-in features designed to enforce 100% answerability and full responsibility for resolving problems such as these at the store and district manager level. You can find out directly from individual business customers what specific problems they have had, and what they would need done in order to resolve them to their satisfaction. The ALR system will then require the responsible store managers to contact the customers and resolve the problems, and it will automatically notify the responsible higher-level managers when customers are not contacted or problems are not resolved within a given time.